System requirements: Needs 35mb of hard drive space. Any system running Amiga Quake. 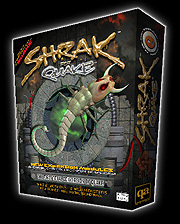 Synopsis: Shrak is a full conversion for Quake. Nine new monsters including the FireCrawler, Gorok, Viscor and Ruckus Riot. It has nineteen new levels. Nine new weapons like the Claw, Foe 2 Friend Converter, Plastic Explosive, Proton Laser, Liquid Cooled Uzi, the Inflater Dartgun, HFB Launcher, and Missle Launcher. One interesting technical addition to the gameplay is the fact that the texture map of the monsters changes as they take damage. This allows you to more easily gauge if you are doing any damage.